The Vogue cover story is a celebrity rite of passage, particularly if the celebrity is young and female. As such, Vogue cover stories, largely written by men, are generally wedded to a handful of stereotypes about young women: the innocent Hollywood ingenue, the exotic beauty, and even the hot girl with surprising substance. 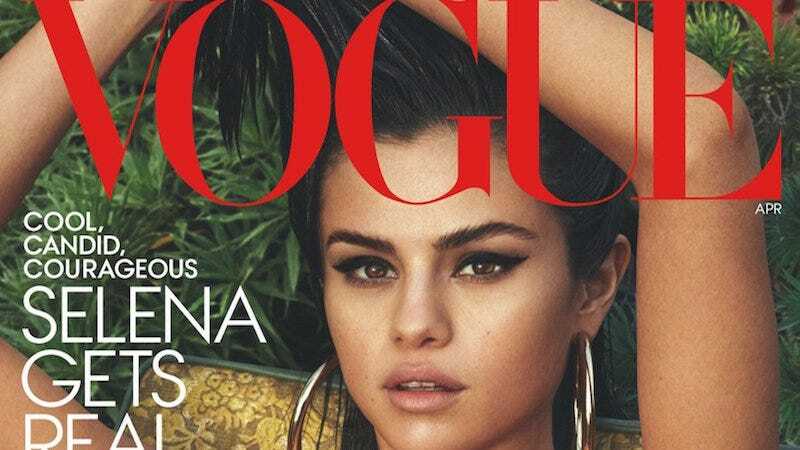 In its profile of Selena Gomez, who graces this month’s cover, Vogue digs deep into the trope of the fragile and vulnerable girl, saying little of substance about Gomez but quite a lot about Vogue’s commitment to clichés. The profile, written by Rob Haskell, treats Gomez as an otherworldly creature; a woman who is scarred but not broken by love, made authentic by her fragility, and defined by “enchanting incongruities.” The fact that Gomez is an adult woman successful enough to be on the cover of Vogue is barely perceptible in the piece as it consistently reduces her to a state of vulnerable girlhood (she’s “doll-like” and “startled”) over and over again. There’s even a reference to Woody Allen and Soon-Yi Previn. If you are over 30 and find yourself somewhat mystified by Gomez’s fame [...] then you might wish to watch the video for “The Heart Wants What It Wants.” (You will be late to the party; it received more than nine million views in the first 24 hours following its release.) Before the music begins, we hear Gomez’s voice as if from a recorded psychotherapy session, ruminating over a betrayal. “Feeling so confident, feeling so great about myself,” she says, her voice breaking, “and then it’d just be completely shattered by one thing. By something so stupid.” Sobs. “But then you make me feel crazy. You make me feel like it’s my fault.” Is this acting? Is it a HIPAA violation? Either way, there is magic in the way it makes you feel as if you’ve just shared in her suffering. Pay dirt for a Selenator. As I slip an apron over her mane of chocolate-brown hair, for which Pantene has paid her millions, and tie it around her tiny waist, I wonder whether her legions have felt for years the same sharp pang of protectiveness that I’m feeling at present. But the framing of the Vogue profile sees Gomez’s mental health as little more than an accessory of her innate sadness which is simultaneously both artistic and, perhaps, the reason she is famous. Haskell implies that Gomez’s relationship with Justin Bieber has undone her (she never says that) or, perhaps, she was simply born into sadness. “Gomez’s childhood successes were always tinged with sadness,” Haskell asserts. In short, Selena Gomez is sad and her sadness is why is she famous but being famous makes her sad. In the end, Gomez and Haskell eat cheesy potatoes which, according to Vogue at least, some kind of winsome metaphor for authenticity. Maybe Vogue should stop letting men write these cover stories.